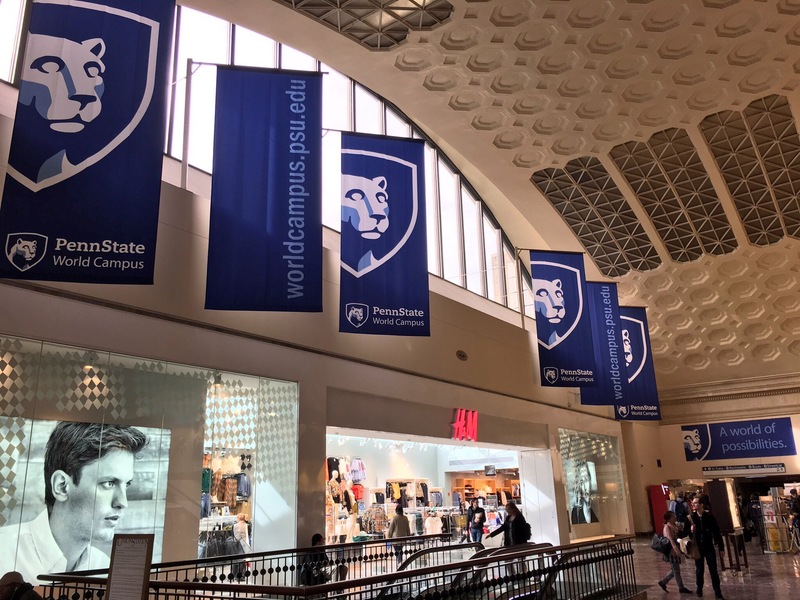 Early this morning I left 30th Street Station in Philadelphia, and was impressed with the monumental Penn State presence throughout the station. Monumental architecture matched by monumental advertising. I’ve spoken with some friends who are concerned that Penn State World Campus promotion of this sort weakens the overall Penn State brand. I share that concern to a degree, but I think Penn State is creating a valuable and (certainly lucrative) niche for itself as a global university in a quality way—distinct from bottom of the barrel University of Phoenix for-profit models. On arriving at Union Station in Washington, there was similar signage. Visually impossible to ignore. Where I do have serious concern is the lack of thoughtful scholarly conversation about how Penn State World Campus can perpetuate the “Penn State spirit” amongst students who will largely never experience Penn State or enjoy the fruits of the Nittany Valley, or hike Mount Nittany. Maybe start by mandating a first year seminar introducing students to our history and our founding vision as a place blending the classical and mechanical arts.